Austin’s status as the capital city of Texas is both a privilege and a burden. State government employs thousands locally and is a major contributor the local economy. The State Capitol building is a beautiful, historic contributor to the increasingly higher, modern Austin skyline. However, Austin’s local political culture noticeably clashes with that of the state. State legislators occasionally file bills to curtail some of Austin’s more idiosyncratic policies, such as the recent ban on single-use plastic bags. The differences between Austin and most of the rest of the state are not solely political or cultural. Right in the center of Austin is a physical manifestation of the divide. This is the ‘Capitol Complex,’ an area that has been criticized as “the greatest single problem of Central Austin’s built environment […]: scale-less, inhumane, and inactive” (McCann, 2008, p. 37). This area is almost entirely owned by the state government. As such, it is exempt from municipal land use laws. Some of the more Austin-wary legislators might like a little more direct control over the city. They already have it right here in these roughly 120 acres, a micro-fiefdom directly ruled by the State between downtown and the UT campus. The Capitol Complex is glaringly different from the rest of central Austin. Almost two decades of focused redevelopment downtown has resulted in an increasingly changed urban environment. Gone are most of the low-rise warehouses that gave moniker to the Warehouse District. Surface parking lots are endangered species, and all-residential high-rises speak to the desirability of downtown as a place to live. A healthy mix of business, residential, and leisure makes downtown a truly 24-hour zone of activity. There is a sense of “place” downtown; when you’re there, you know it. Theories of “place” mention various attributes, from the presence of a vernacular culture inspired by unique, locally-rooted components (Carr & Servon, 2008) to simply stating that a “place” is where people feel compelled to spend time (Bain, Gray & Rodgers, 2012). By contrast, the Capitol Complex is a “non-place” plagued with walkability challenges. This is the result of almost 60 years of disjointed planning efforts and the fact that it is an area with one purpose: housing the state bureaucracy. The Capitol Complex arose in middle of the last century from the rubble of a traditional neighborhood razed to make way for big ambitions. In 1941, the state legislature passed a bill acknowledging that the costs of leasing office space to house the growing state bureaucracy were becoming excessive. Lawmakers approved a solution which acquired roughly 70 square blocks around the Capitol, mostly to the north, upon which to site state-owned office buildings. They commissioned a master plan, which called for a massive cluster of Sovietesque mid-century modern edifices looking like dominoes on the march towards the UT campus (Harold F. Wise Associates, 1956). Mercifully, this vision never made it out of the pages of the master plan. The contemporary Capitol Complex, however, is just as uninspiring. The Capitol Complex today consists of a smattering of mid-rise state office buildings, surface parking lots, massive concrete parking garages, and a small inventory of historical structures which serve as vestiges of the neighborhood as it was before the State bulldozers rumbled through. It is a mono-purpose district. There are few destinations for diversion or commerce within. The business here is state bureaucracy, a strictly 9-to-5 endeavor that leaves the area deserted in the evenings and on weekends. 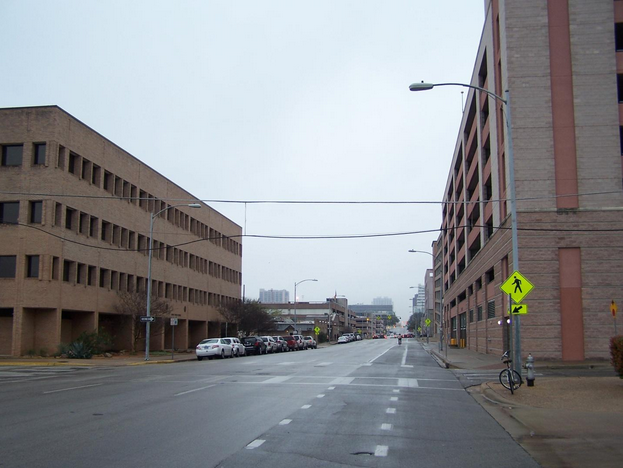 The somnolence of the zone is in direct contrast to the surrounding areas: the UT campus to the north and downtown to the south. As downtown Austin has been built-out in recent years (the real estate inventory no longer contains the full city blocks desired by developers seeking to build large-scale projects), surrounding areas have increasingly been targeted for the mixed-use, mid-to-high rise projects characterizing downtown. The city council is currently discussing changing land-use regulations along East Riverside Drive to accommodate high-density, downtown-style development. Similarly, cranes fill the sky of the West Campus neighborhood near UT as mid-rise apartments and condos go up. Central Austin real estate is a valuable commodity, a fact that has not escaped state policymakers as they face budgetary challenges brought on by the recent recessionary period. The State’s Capitol Complex landholdings are a valuable asset. 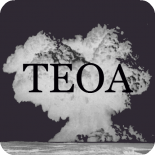 Recently, the Texas Facilities Commission (TFC) warned that the State found itself in the same predicament it was in during the 1940s: state workers were scattered all over town in leased office space, costing taxpayers millions a year. The TFC saw a potential solution literally in the backyard of the Capitol. Acres upon acres of property sits underutilized in the Capitol Complex; why not build new state office buildings there and throw some retail and residential uses in for good measure? The 82nd Legislature seemed to be on board with the idea and passed the 2011 Public and Private Facilities and Infrastructure Act. This set the stage for the TFC to accept unsolicited proposals from private developers for projects in the Complex. One particularly bold proposal was for a high-rise planetarium/condominium at the corner of MLK and North Congress. This intersection is home to two other attractions, the Bob Bullock Texas State History Museum and the Blanton Museum of Art. In 2013, the 83rd Legislature effectively put the brakes on what the previous session had done. A report from the Sunset Advisory Commission (2013) raised concerns over the public/private partnership process (citing a lack of transparency, among other things) and recommended a moratorium on proposals until the legislature could sort things out. The planetarium/condominium was D.O.A. Meanwhile, Austin area voters approved a bond to build a new medical school affiliated with UT. Officials were hinting that the school would be located just northwest of the Capitol Complex. This no doubt has further kindled interest in redeveloping the Capitol Complex. The public side of the equation includes state office buildings. The private side would probably include mixed-use development like that seen in the rest of central Austin, with ground-floor retail topped with offices and residential units. The Capitol Complex is in a prime location. The State stands to potentially gain millions from ground-leases for private development. This tactic has been used elsewhere in Austin, including the Triangle mixed-use center and the shopping center containing the Central Market on North Lamar. However, the State should be diligent in ensuring that redevelopment aids in creating a walkable “place” out of the Complex. For the most part, basic pedestrian infrastructure exists in the Capitol Complex. However, the combination of a lack of destinations and activity, the inhuman scale of the buildings, and lack of comforts such as shade and seating make walking through the zone unpleasant. The San Jacinto Boulevard corridor in particular is offensive to pedestrians. 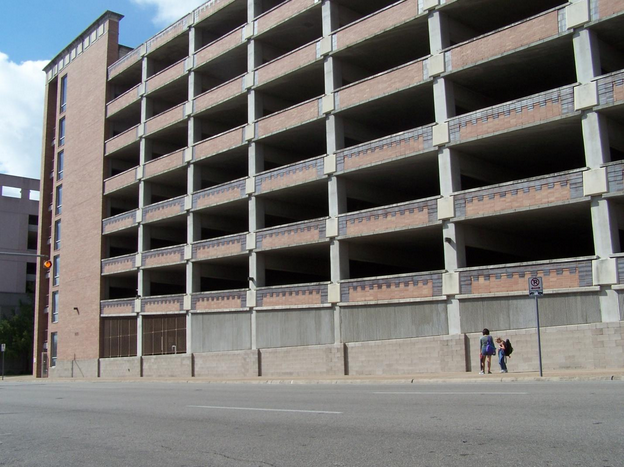 This street is lined with massive characterless concrete parking structures. There are few trees to shade walkers from the hot Texas sun. Visitors and employees to the Complex most likely dash from air-conditioned vehicles to air-conditioned offices, leaving the sidewalks deserted. This leads to a feeling of insecurity, despite the fact that the area isn’t dangerous by any means. Bureaucracies are often characterized as faceless and boring machines, droning on day in and day out. The Capitol Complex is a physical manifestation of popular imagery of state government. Its characterless buildings fill by day with workers who quickly evacuate the area at night, leaving the zone a ghost town. The anonymity of government activities combined with the desolation of the place at night contributes to make the Capitol Complex a “non-place.” Further exacerbating this status is the area’s proximity to other parts of the city that are unquestionably “places” in their own right: downtown and the UT campus. Future redevelopment of the Capitol Complex should mimic policies in the rest of central Austin that have helped to make the area more active and pedestrian-friendly. A mix of destinations and land uses will foster 24-hour activity in the area. New development projects should be required to improve the pedestrian experience. A comprehensive placemaking program designed to capitalize on features already present in the Complex (such as the State Capitol, museums, and historic structures) can help to give the area a distinctive character. Some might complain that this sort of mixed-use, New Urbanist-inspired development is exactly what has made downtown Austin a completely different place from what it was decades ago. However, it seems that redevelopment is inevitable. By utilizing Capitol Complex land to its highest potential, Texans stand to gain more efficient use of their tax dollars. Austinites stand to gain new places to live and work in surroundings that harmonize with the recent Imagine Austin comprehensive plan’s goals. The “greatest single problem of Central Austin’s built environment” could become a great asset. Parking garage along San Jacinto Boulevard. Photo by author. San Jacinto Boulevard, looking south. Photo by author. Bain, L., Gray, B., & Rodgers, D. (2012). Living Streets: Strategies for crafting public space. New York: John Wiley & Sons. Harold F. Wise Associates. (May, 1956). Capitol Area Master Plan. Texas State Building Commission. McCann, J. (2008). Districts for Downtown Austin. In Emergent Urbanism. Austin, TX: University of Texas School of Architecture. Texas Sunset Advisory Commission. (January, 2013). Sunset Advisory Commission Staff Report: Texas Facilities Commission. Like all other Austinites, Matt Clifton (M.S. Community & Regional Planning; M. Public Affairs, University of Texas at Austin, 2013) arrived shortly before another Austin landmark closed for good: the Dobie Mall Theatre. He recently worked as part of a multidisciplinary group from the University of Texas to implement a community-scale worm composting pilot project in the Dominican Republic. Their experience is chronicled in the book Los Cinco Corazones (UT School of Architecture, 2012). He has lived in Kentucky, D.C., Oregon, and Chile, but actually looks forward to stepping off of the plane at Bergstrom. There are a lot of ways to describe the Capitol Complex but I don’t think “inactive” is one of them. The area is criticized for not being walkable. It looks like “walkable” in this context means linger-able, stroll or moseyable, where the streets can be filled by people who live there. You don’t get that in the Capitol Complex because the sidewalks aren’t the destination, the Capitol is, the state buildings where people come from far away to conduct their business and then leave so the next in line can get help without being hindered by high-rise dwellers looking for coffee. The parking garages serve the destinations ringing the area (e.g. Erwin Center, hospital, Waterloo Park) because downtown and the University have overpriced or built over the available parking (to my urbanist friends: not criticizing, just observing). The wide streets and parking garages makes this area the top choice for pop-up transit hubs for special events like Formula1 or all sorts of rides and runs that couldn’t happen if businesses lined these streets. There is a small boarding house mid-block on 15th where my wife lived as a student, and except for the occasional late night ambulance siren, it was affordable, serviceable, and perfectly suitable. I worked for years in the Capitol Complex and didn’t have any trouble walking downtown or to the University. Given the area’s role, I’m not sure that becoming a “place” is such a necessary or laudable goal. The area has obvious destinations like the Capitol, the Bullock Museum, and Scholz’s, but also has many treasures that are lesser known, like the underrated State Library and Archives, the beautiful art deco lobby of the DeWitt Greer Transportation Building, the maps, archives, and records at the Land Office, and the Texas Historical Commission library in the 1883 Gethsemane Lutheran Church. It’s an easy walk to Lavaca and classic Austin restaurants like Chili Parlor, Thundercloud, and El Mercado, or to Serrano’s on Red River, or to duck into the Messhall Cafe in the basement of the Secretary of State’s offices. When my son was younger, on weekends we would tie parachutes to various toys and go to one of the parking garages on San Jacinto and from the top floor he’d release whatever it was over the trafficless side street, run down the stairs, and do it again. Can’t do that on Sixth Street. This entry was posted on May 18, 2013 by The End of Austin in Built Environment, History, Politics and tagged architecture, capitol, downtown, government, Issue 3, legislature, University of Texas, urban design.